If you live in Ireland, this will be a pretty useful resource for you. If only the entire world had a map this good! In fact, if only the entire world had wind this good! “The Sustainable Energy Authority of Ireland, will host an event, launching the new SEAI Online Energy GIS and remodelled SEAI Wind Atlas, on the morning of Wednesday September 23rd. 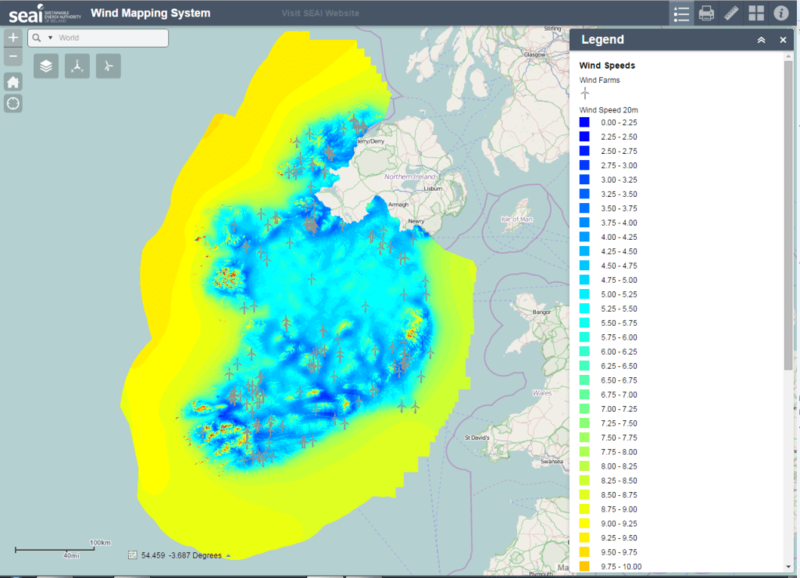 Presenters from SEAI, Esri Ireland and the U.K. Met Office will highlight the improved features of the new, Esri ArcGIS-based, SEAI online Energy GIS, the energy related spatial datasets that will be accessible within this and of the enhanced remodelled wind atlas viewer. Please find attached the SEAI invitation to this event. SEAI will shortly circulate full details of the seminar, please feel free to circulate this notice to colleagues who may be interested in attending. In order to facilitate our planning for this event SEAI would request that you register your interest by e-mailing events@seai.ie<mailto:events@seai.ie> . We will then include you in the circulation for updates on the agenda and venue. Yes indeed a new Wind Atlas for Ireland made by the UK Met Office. It replaced the 2003 Wind Atlas made by ESBi and AWS Truewind. The new wind atlas is quite an extraordinary publication. Have UK Met Office or SEAI discovered new Physics? First thing to notice is a ~50% fall in the mean power density 100m a.g. at Oweninny between the 2003 and 2013 Wind Atlases. Power density varies as wind speed cubed. Second is 2013 Atlas shows a roughness length at Oweninny, as measure between 50m and 100m, of 2.2m. Oweninny is a strip mined peat bog in County Mayo some ~15km from the Atlantic. The true roughness length must be less than 1cm and probably closer to 1mm, Has anyone every measured a roughness length of 2.2m anywhere on Earth? WMO draft 2014 draft t guidelines for instruments suggest instruments should be checked in a wind tunnel if they indicate a roughness length of 2.0m. EWEA association has maximum roughness length of 1.6m corresponding to urban high rise landscape. To understand how the roughness length reached 2.2m you would need to know that the state owned power company,ESB, and the state owned peat company, Bord na Móna (BnM), are planning to build a 371MW wind farm at Oweninny. These companies supplied the data against which the 2013 wind atlas was verified as the Energy Minister has told the Dáil. Happy then for ESB and BnM that the new 2013 Wind Atlas for Ireland, issued in the name of UK Business Secretary Javid, rather precisely supports the 33% capacity factor that ESB and BnM put in their planning application. After all the DTI survey, UK onshore wind capacity factors 1998-2004, looked at metered UK wind farm production over 7 years, 8 wind farms in Northern Ireland were included in that analysis. The mean capacity factor for the NI wind farms was 36%. Only in a one year did the measured value measured capacity factor fall to 33%. All of the turbines considered were much smaller, and with much lower hub heights <90m that those proposed at Oweninny, min 90m. Thanks a lot UK Met Office, UK Business Secretary Javid and Her Majesty's Goverment for screwing the us peasants in County Mayo.